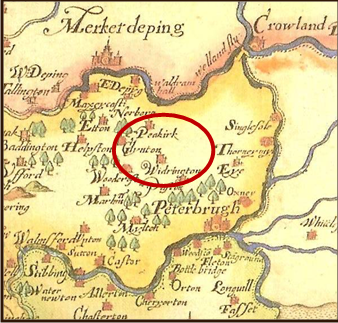 On 2nd May next year at 7 30pm in Werrington Village Centre, Dr Avril Lumley Prior will be giving a talk to Werrington History Society about Peakirk’s past. Peakirk is a fen-edge settlement, approximately four miles north of Werrington Village. It is best-known for its now-defunct Wildfowl Trust and its association with St Pega, who reputedly founded a hermitage there and gave the settlement its place-name [‘Pega’s church’]. Whilst Peakirk’s history is well-documented from the eleventh-century onwards, archaeological evidence indicates that the area first was colonised by Neolithic folk and that there was almost-continuous activity in the heart of the present village from the Romano-British period onwards. This talk unveils Peakirk’s story through a combination of archaeology, architecture, topography, maps, photographs and written sources. It also features the work of PAST [Peakirk Archaeological Survey Team], an independent, self-funding group, whose recent projects have included re-plotting the route of the Roman watercourse, the Car Dyke, dispelling the ‘tradition’ of a Romano-British villa, rediscovering ‘lost’ buildings and revealing more about Peakirk’s diverse and secret heritage. St Pega’s church in Peakirk was the first church I knew (I came to the village with my family in 1957, before I was 2 years old and we left in 1972, I used to think a church should be named after the saint who founded it). The wall paintings in the church are so faded and damged and damaged we could not work out what they depicted however much I stared at them during sunday school. The most interesting thing about them was the ghost story. A reporter from one of the Peterborough papers turned up early to report on their discovery and he saw about 20 nuns walk in through the north door, bow to the altar and depart again. When the churchwarden turned up he mentioned that he was surprised there were s many nuns at the Hermitage and he was told that there were only 4 nuns and the north door was impossible to open. There have been no further reported sightings of ghostly nuns (as far as I know), although anything could have happened since 1972. My family does have a lasting connection with the church. Some time around 1970 my Grannie used a fine linen sheet, which had been woven from flax grown on her husband’s family’s farm in Dumfriesshire, to make an altar cloth and purificators. Thanks Bob, that is fascinating. The wall paintings are still there and I think there is a talk coming up about them. The nuns in the Hermitage moved out a few years ago, and no recent sightings of ghostly nuns as far as I know!